ALT associates with the ATRX alterations and the I-A signature. A representative image of a grade III astrocytoma section that was positive for both ALT and for p53 nuclear staining is shown in Figure 3 of Jiao et al. 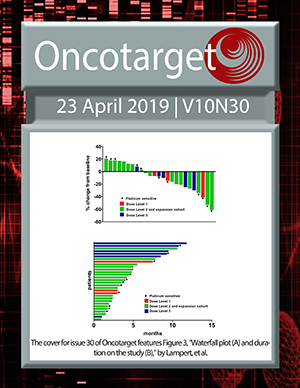 The dynamic range of the image was digitally altered for the July cover of Oncotarget. See Jiao et al. Mutations in circulating mitochondrial DNA: Cassandra of oral cancer? Circulating tumor-derived mutant mitochondrial DNA: a predictive biomarker of clinical prognosis in human squamous cell carcinoma.